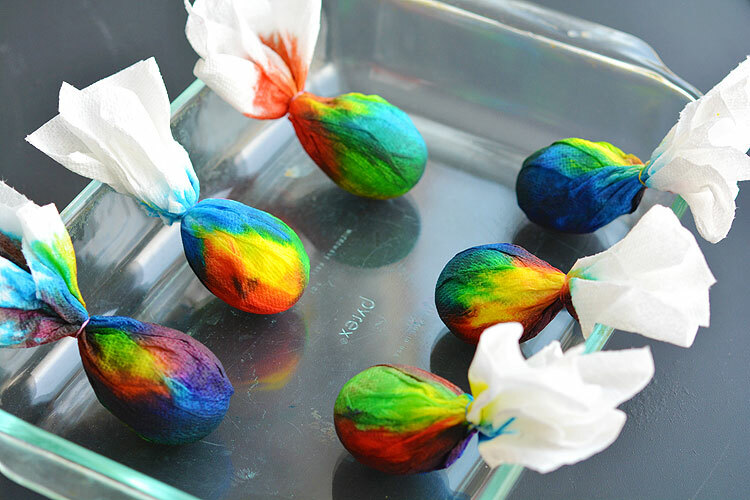 These tie dye Easter eggs were so easy to make! I have to admit, I was a little nervous about the idea of tie dying something. It sounds like it should be scary. Or complicated. Or at the very least messy. But you know what? It wasn’t any of those things! 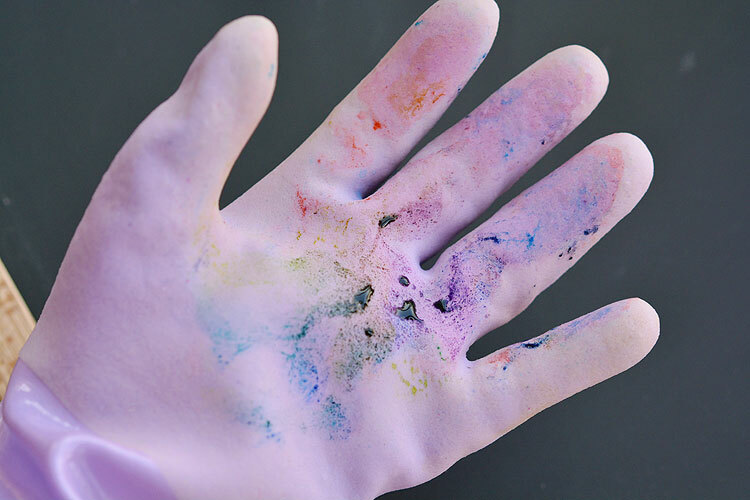 As long as you wear rubber gloves… if you choose not wear rubber gloves and you get food colouring all over your hands, don’t say I didn’t warn you. I don’t have very many Easter posts on the blog. How crazy is that!? Last year I had to go back to work after maternity leave around this time. The year before that I had a newborn plus two kids under 5. And then three years ago I found out I was pregnant with our little guy, baby #3. (Ah, March 2013 when we only had two babies, and I still had time to work on the blog every night after the kids went to bed. Those were good times…) Now, when I look at the handful of posts I published the month after I found out I was pregnant, I have flashbacks of nausea. Like real ones, where I swear I’m going to gag. Have you ever had that problem!? I had a different logo on the blog that I used during that brief period of time, and just looking at that logo STILL makes me feel sick to my stomach. Along with one of the songs from Tangled that my daughter listened to on repeat for months. You’re either going to be thinking,”Yes! I know exactly what you’re talking about!” Or you’re going to be part of the other team, “Um, Debbie, you’re crazy. Can you just move on??”. Okay, fine. I’ve been a blogger for 4 and a half years and this is the first Easter egg post I’ve ever written. You can just ignore that as a craft blogger I’m shaking my head in disbelief that I could have let that happen. 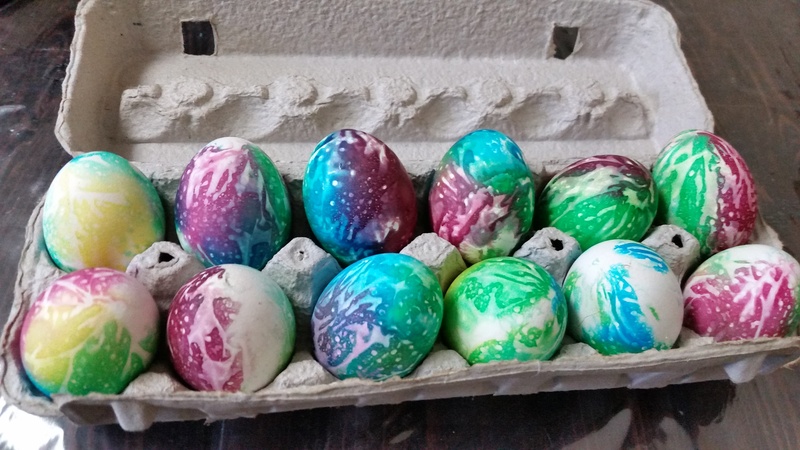 And instead, check out how awesome these tie dye Easter eggs turned out! I had no idea what to expect when I was making them, but they are bright, gorgeous and so much fun! Go ahead and hard boil your eggs. Did you know that you can make hard boil eggs by baking them in the oven!? I’ve been doing it for about 3 years now and I’ve never had a single egg crack! Once the eggs have cooled off, rip apart the paper towels into small sections and place your egg in the middle. Bunch up the paper towel around the egg so it’s completely covered. Twist the end as tightly as you can and secure it with a tiny elastic or a twist tie. I get my tiny elastics in the hair and accessories section at the dollar store. 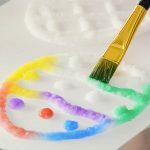 Squeeze drops of food colouring directy onto the paper towel. You’re probably going to want to hold the egg in your hand. I would have needed a third hand to take a photo of me doing that so this was the best I could do. You get the idea though. Try to separate the food colouring drops so that there is some white space between them. You definitely don’t have to leave the space, but it helps to keep the colours from completely mixing into one another if you leave some room. Take your spray bottle of water and squirt a small amount of water into the middle of each of the food colouring drops. 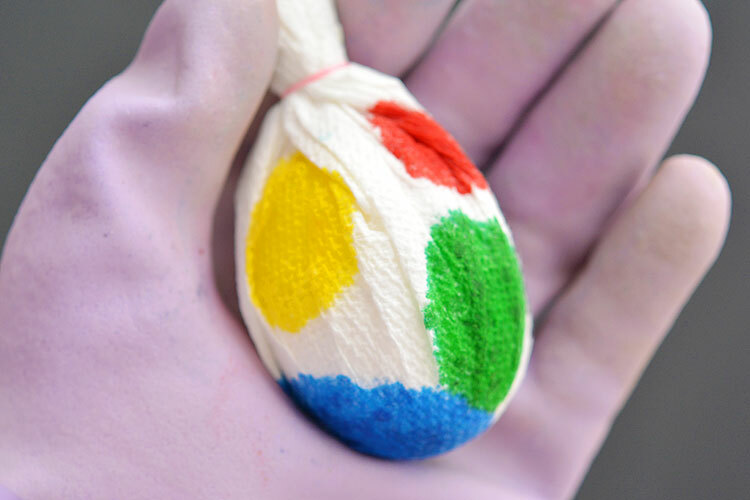 If you can still see white paper towel, the egg underneath will be white in that area, so keep spraying until the paper towel is completely coloured. 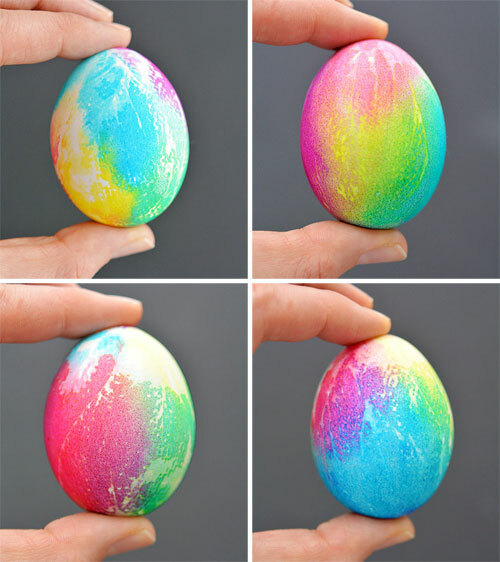 But keep in mind, the more water you spray, the less bright the colour on the egg will be. It’s a balance. Gently squeeze the egg over the sink if there’s any extra water. 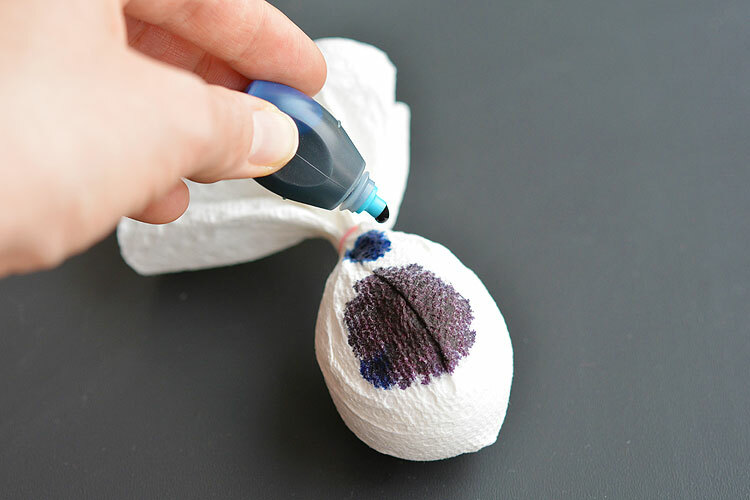 Even if there isn’t, squeeze it gently anyway to make sure the colours on the paper towel transfer to the egg underneath. Set the eggs in a glass dish or on a baking sheet to dry. I was impatient so I pointed a table fan directly at my eggs and they were completely dry in about 3 hours. I definitely recommend you do the same, otherwise you’ll need to leave them overnight to dry. This is going to sound cheesy, but it was like unwrapping a present. Ta-da! I love how the texture from the paper towel made an impression on the eggs! There has to be something you can do with the beautiful tie dyed paper towels you’re left with at the end so you don’t just throw them away?? What if you cut out a square of each paper towel, pinch it together in the middle with a pipe cleaner or clothes pin and turn it into a super simple tie dyed butterfly when you’re done? I wish I had thought of that yesterday! The colours were bright and beautiful, and even though I used the same technique on all of them, each egg looked completely different. In case you’re wondering, yes, the food colouring does leach through the egg shell a little bit. But only a few dots here and there. It’s food colouring, so the eggs are still completely safe to eat. Wrap the paper towel up and around the egg so it's completely covered. 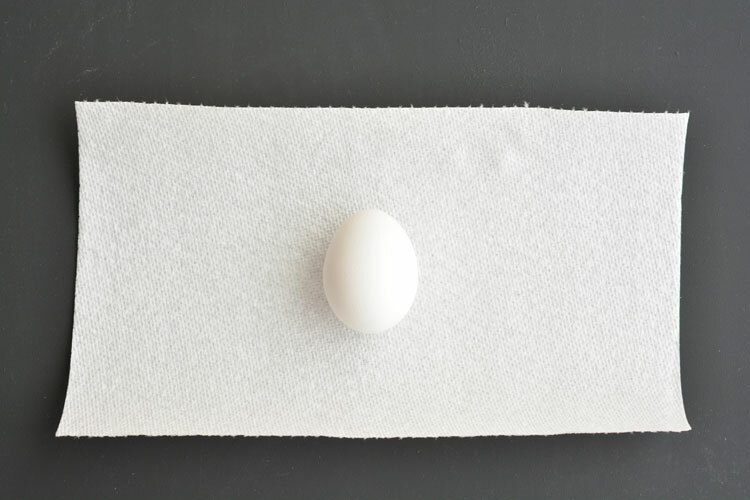 Twist the top of the paper towel so it's tight against the egg and secure it with a tiny hair elastic or a twist tie. 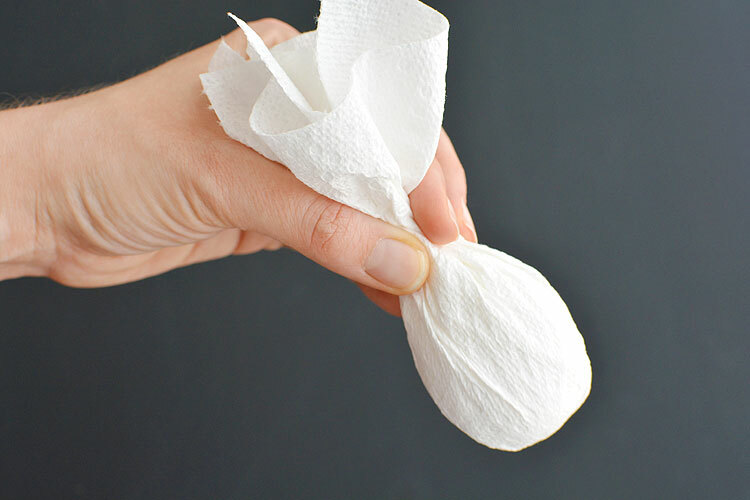 Gently squeeze the wet paper towel wrapped egg over the sink to drain any excess water. 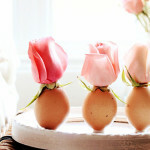 Even if there's no extra water, gently squeeze the egg to make sure the colour on the paper towel transfers to the egg. Place the wet, paper towel wrapped eggs in a baking dish. 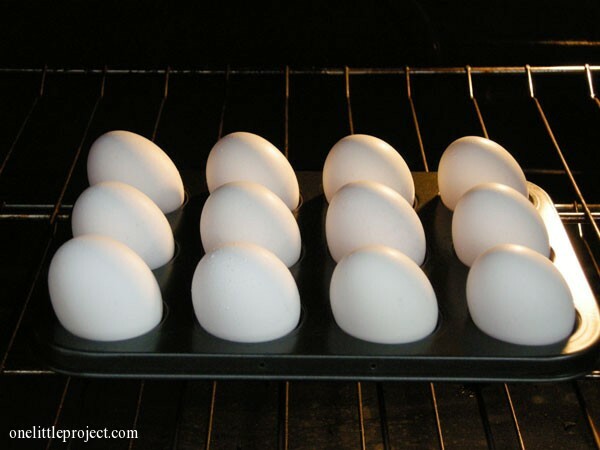 Point a table fan at the eggs and allow them to dry for 3 to 4 hours. (Without a table fan, you'll have to wait overnight for them to dry). It's best if you can make these the day you plan to serve them. If they MUST be refrigerated, place the eggs in an egg carton. Make sure you remove them from the fridge (and open the egg carton lid) at least 3 hours before you plan to serve them to give time for the condensation to dry. 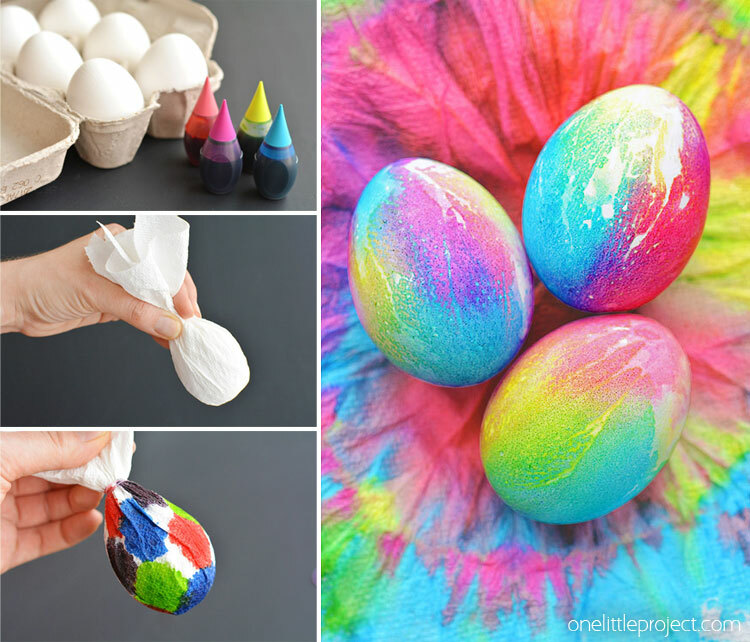 These tie dye Easter eggs are SO FUN and they’re so simple to make! 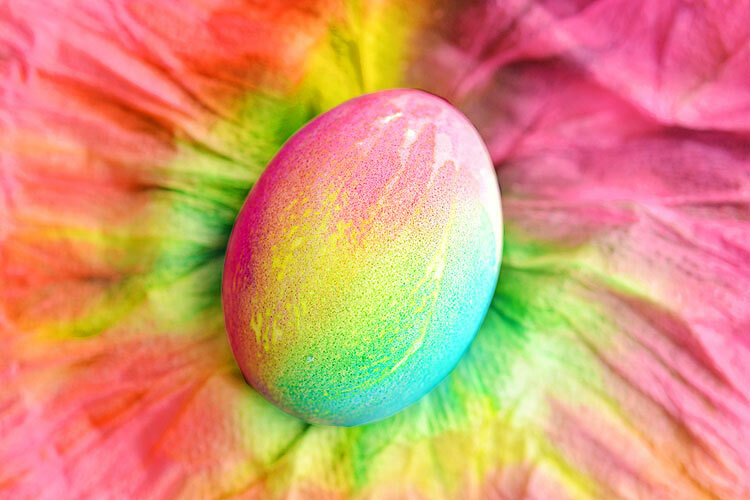 The colours are bright and beautiful and since it’s just food colouring, the eggs are completely safe to eat! And if you wear rubber gloves and make them over top of a large baking sheet, it’s shockingly easy to clean up too! These are lots of fun! 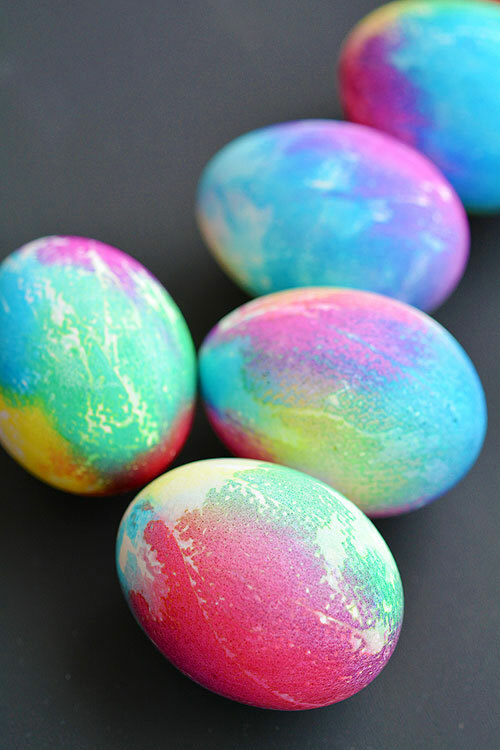 Be sure to check out our method for making super bright Easter eggs with a shiny finish. These are so easy to make and they’re completely safe to eat! I wish I had tried it sooner! You could stack the paper towels on top of each other, fold in accordion pleats, fold in half, secure the middle and separate to make a flower. Brilliant!! 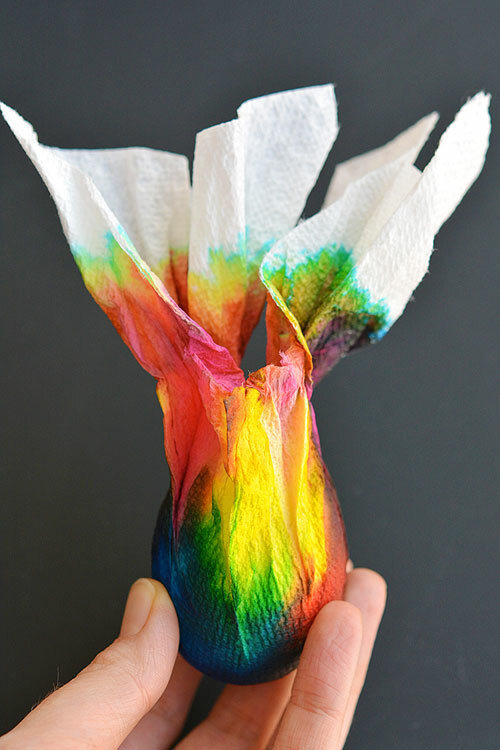 I love that idea as a way to use up the tie dyed paper towels!!! Those flowers would be gorgeous!!!! Would the colors hold better if you used vinegar instead of water? I found the colours held really well until I refrigerated the eggs. Then the condensation made them a bit messy, but they still held the colour. I’m definitely going to try it with vinegar next time. I’m really curious to see if it makes a difference!! I was thinking about the vinegar. 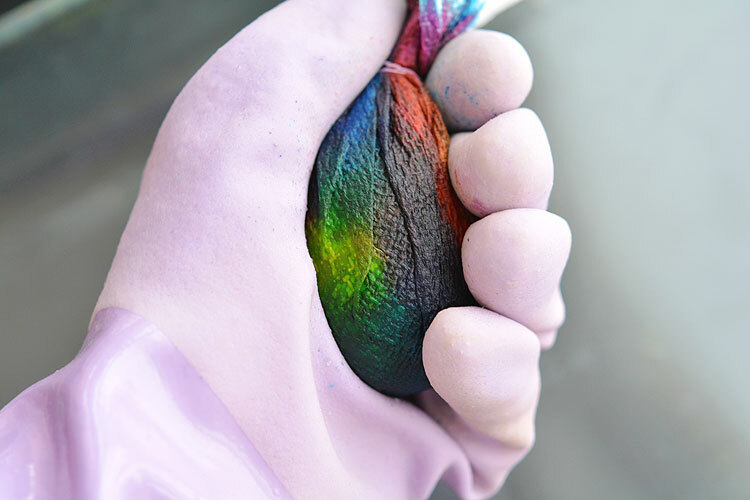 What if you mixed the food coloring and vinegar and water in a cup as if you were going to color “plain” eggs but tie die them like in the video, using the vinegar solution. And you could make a few plain eggs “for old times sake”! You could even leave them wrapped when you put them in the baskets and let the person opening them get the surprise reveal. Great idea!! That would be so much fun!!! We use cotton soaked in vinegar to wrap the eggs. The result is very light and bright colours ? Ooooooo… I’ll have to try it with vinegar next time!! Thanks for the tip! Can you put them in the oven (low temperature?) so the dye dries faster? Maybe, especially if you have a convection oven. But I’d be worried that even with a low temperature oven the eggs might get rubbery from over cooking? I’ve never tried it, so I can’t say for sure. The table fan worked really well for me. Hi, I have a question, are the white eggs cold or warm? Thanks a lot for this beautiful idea! Hi Bettina – The eggs I made were hard boiled and then cooled in cold tap water for about 20 minutes. You don’t want them too cold or you’ll get condensation and that could mess up the transfer of the colours. Hi Debbie, I cannot remember the last time I saw white eggs, our eggs are all brown. 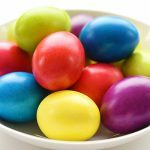 Are you shelling the eggs before you dye them? Hi Jane – The white eggs still have the shells on. Our grocery stores sell both white and brown eggs here. That is what I thought, thank for your reply. Now i just need to find white eggs. the brown eggs don’t dye very well. Do you think you can do this process on rocks? I’ve never tried it on rocks, but I don’t think the food colouring would show up very well?? Usually the projects I see with rocks use paint to get better coverage – even just acrylic paint from the dollar store. Maybe acrylic paint and cheesecloth might work on rocks to get the tie dye effect?? Hi Jane, why not take the dry paper towels and run them theu a paper shredder, or cut with scissors into long strips and use as Easter grass in the baskets! ooopppsss meant Debbie not Jane! So sorry! you could use blown eggs to keep for decorations. Could you do this with coffee filters? They make really pretty paper flowers with a green pipe cleaner. Hmmmm… you could always try? I’d be worried that with coffee filters it might be difficult to wrap them well enough around the egg so the filter is making contact with the egg? But I’ve never tried it, so I can’t say for sure? It’s a fun idea to try though! We used the neon colored food coloring. Let them sit for 1 hour before the big reveal. Did this with my 19 year old daughter… 29 year old daughter is doing it with my 3 grandsons tonight. 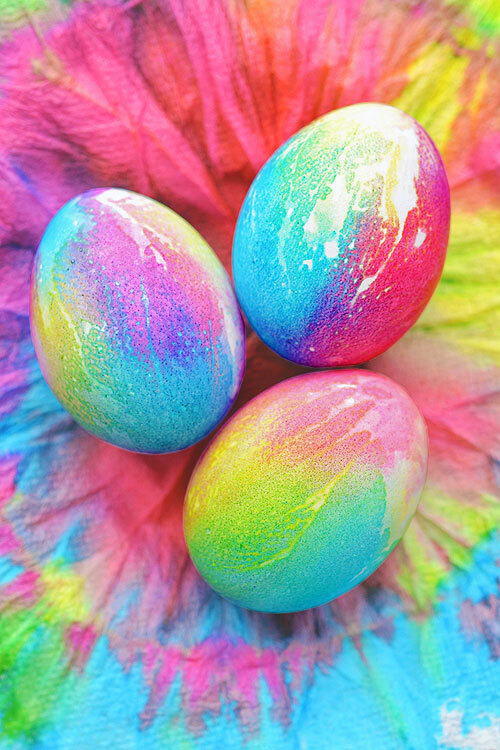 The eggs are beautiful! We are going to do this later on today. Late is better than never right? I just wanted to add- the Minecraft theme music still makes me sick. And my daughter is 18 months old. I would like to try with different textures, lace, cut out small shapes, buttons. 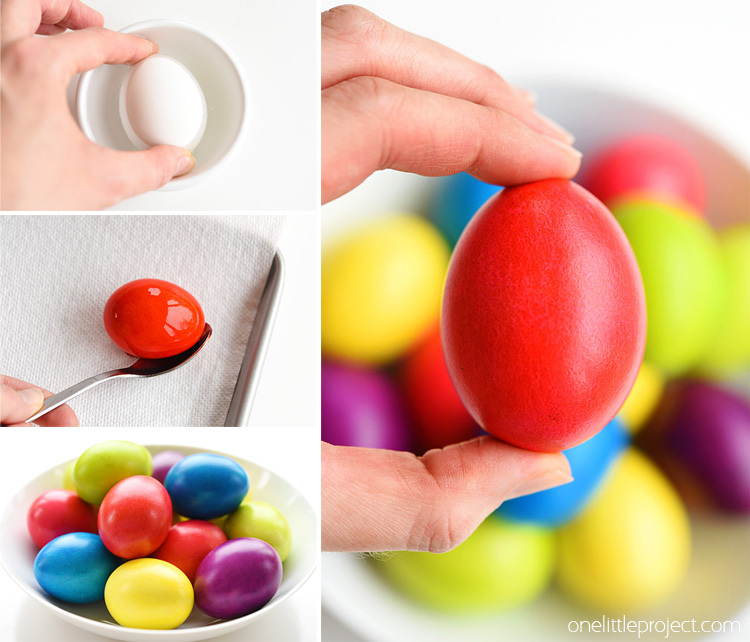 Have you ever tried doing this with wooden eggs? I’m a teacher and couldn’t use real hens eggs….. Mine are drying now! 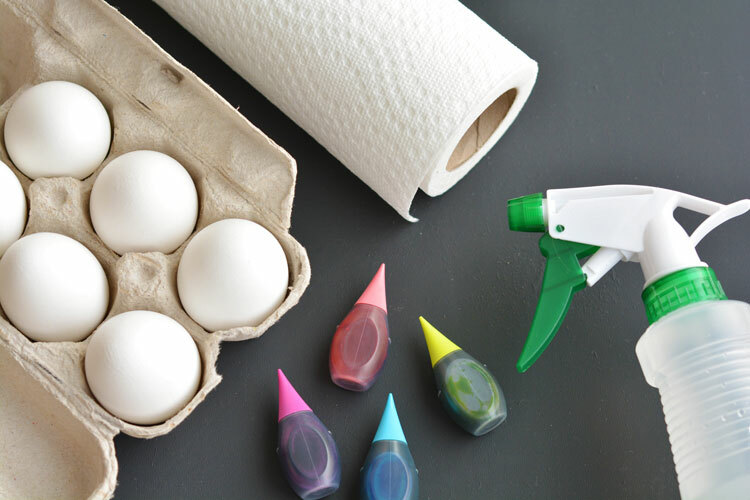 I want to try it with toilet paper also because I’m thinking the color will touch the egg easier because it’s thinner and won’t bunch up as much as the paper towel did. But I can’t wait to see how they come out yours look beautiful!!! Dip one cut piece of paper towel into vinegar,wrap it around the egg. Place egg into the palm of your hand with a piece of plastic wrap on you hand. 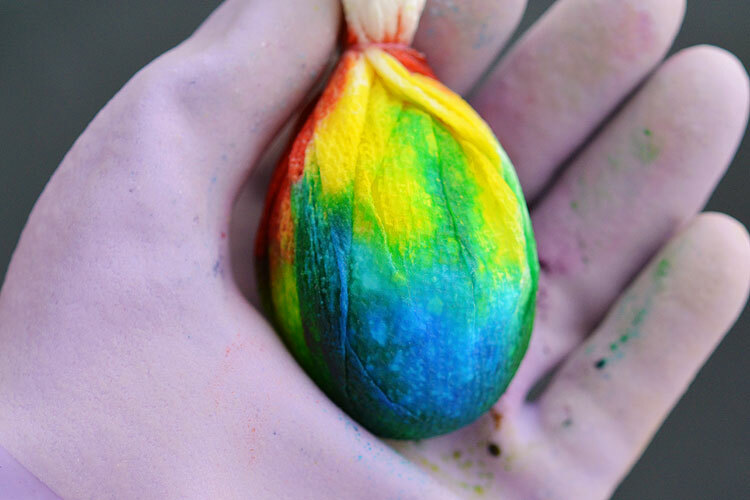 Now just drip different color drops of dye all around the egg. seal the plastic wrap around the egg set aside and continue the process until all eggs are wrapped. Now just wait an hour or two. 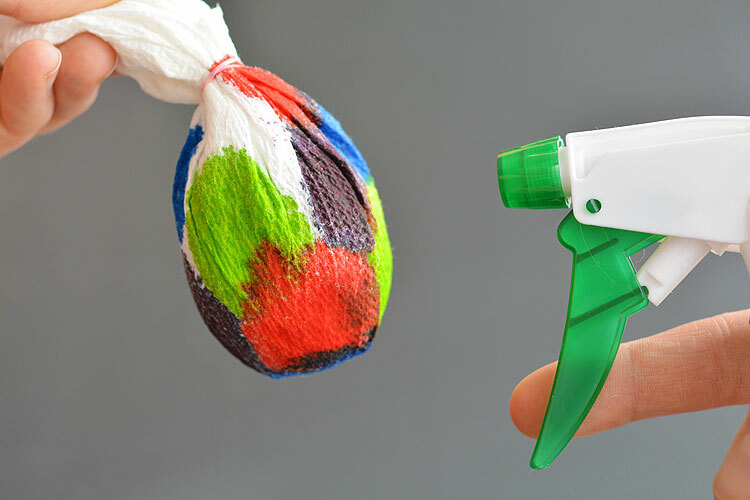 Put on gloves unwrap eggs and place on paper towels until dried. My daughter and I made these this year! They came out fabulous! I wish we did them all this way. Thanks for sharing! 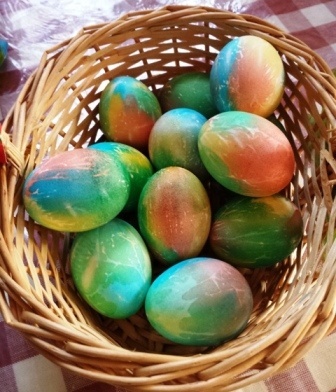 My family and I have always done traditional Russian Easter eggs dyed with onion skin, but it’s SUCH a hassle. My daughter and I did this last night and they came out perfectly!! We did tweak your instructions just a bit by using tissue instead of paper towels and I sprayed them with a vinegar/water mix instead of straight water. We did them around 5pm and I put them in cupcake tins and put them in the fridge overnight. The colors were SO vibrant and it really WAS like opening a little package! I wish I could post a picture! We tried this today and we really enjoyed it. My boys were so excited we were doing tie dye lol Easter Sunday was a success and this project contributed to it! Instead of twist ties i used rubber bands that i had on hand and we cooked the eyes in the UV. Thank you for sharing!!!! Also i posted pics of our work on snapchat with the boys doing this project and shouted you out. lol They loved it! 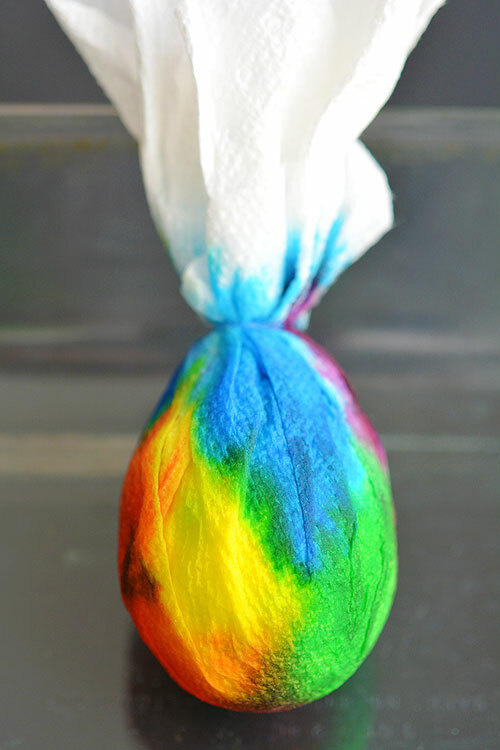 I love that idea as a way to use up the tie dyed paper towels!!! Those flowers would be gorgeous!!!! 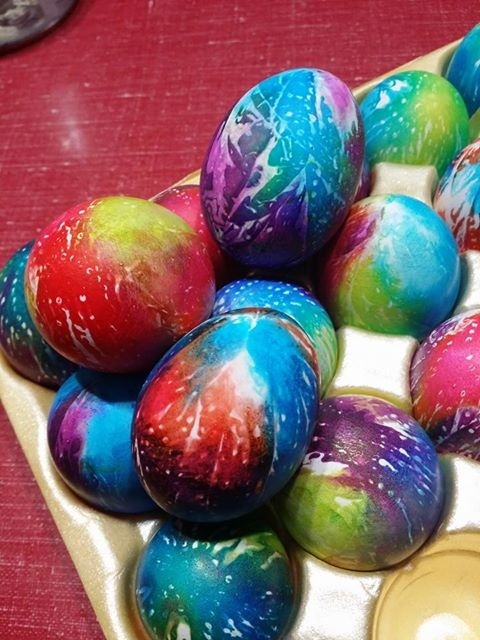 These eggs are beautiful. I just wanted to add- the Minecraft theme music still makes me sick. I’m definitely going to try it with vinegar next time. I’m really curious to see if it makes a difference!! 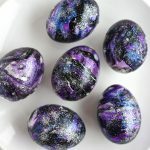 The eggs are beautiful! I love tie dye! And to this day, if someone even says Mango gum, I throw up a little bit in my mouth, so I know exactly what you are talking about!